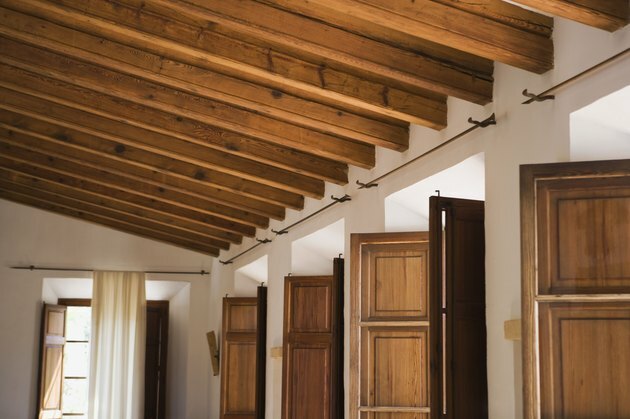 Headers and beams are two types of wood that builders use to create a home. Headers are typically used on the frames of windows and doors, while beams are the literal support structure for the roof. Both serve as support systems for the house, although to a lesser degree in the case of headers. Once you determine the weight support needed, you can then move on to sizing the actual beams and headers. Beams and headers form the support structure of a home. Select a type of wood based on your load needs. Engineered wood and sawn lumber are the two most common choices for home building but may differ in they type of loads they best support. Engineered wood is often stiffer and provides more support under stress, but is typically much more expensive than natural wood. Use a span table to determine the total load of foot per beam. An appropriately sized span table allows you to choose from pre-made columns to help you make your choices by showing the range of lumber types and each one's capacity and recommended loads. Choose the appropriate span from those listed on the table. This is the literal sizing for the headers and beams since you'll be selecting a length and width of material. Move down the column of the lumber you've selected to see the capacity listing. Check that its load capacities are adequate by using the actual listed numbers for each span and type. If your job calls for a higher load, you'll need to pick a different type of lumber. Double your beams for further support in planning and in building. The weight capacity doubles with each of the same type of beam you add at one support location. Check the sheer value of your headers and beams to see that you haven't exceeded their capacity. Different types of lumber have different sheer values that are representations of individual capacity regardless of doubling.